Welcome to METTLER TOLEDO's webinar on time–temperature superposition using Dynamic Mechanical Analysis. Dynamic Mechanical Analysis, or DMA, is an excellent characterization tool for determining the frequency dependent behavior of viscoelastic polymeric materials. Time-temperature superposition, or TTS for short, has been investigated extensively by Williams, Landel, and Ferry. It allows one to extend the experimentally accessible frequency range from about 3 to 20 decades. The procedure involves taking a series of isothermal measurements over the largest frequency range achievable for a given sample. The resulting isothermal curves can then be shifted towards a selected reference temperature to create a master curve, which enables the description of relaxation behavior in materials over a wide temperature and frequency range. In the following slides, I will provide some background information on TTS, before going into more detail with some specific applications. How a master curve is constructed. I then demonstrate, using numerous examples, how and when the time-temperature superposition principle can be used to investigate material properties and their related behaviors. The mechanical properties of materials vary widely, metals for example are generally stiff, strong and ductile; ceramics are usually stiff and brittle, but have excellent high temperature resistance. Most polymers and composites do not have such high strengths, nor are they resistant to high temperatures, but they offer a significant advantage in being readily formable and, when designed correctly, light-weight—a key feature of plastic parts used in the automotive industries. Another distinguishing feature of these materials, which is not observed in metals or ceramics, is their viscoelastic behavior over a temperature range of minus fifty degrees Celsius to three hundred degrees Celsius. Such temperatures are experienced in everyday life and in many industrial applications. The mechanical properties of materials showing viscoelastic behavior, depend greatly on the frequency of any loading or deformation. This is illustrated in the slide using a pliable model putty. This material exhibits two distinct types of behavior at room temperature. If it is formed into a ball and thrown to the ground, as seen on the right, it behaves elastically and bounces back like a tennis ball. In contrast, when left for ten minutes or more, it begins to flow under its own weight, like a viscous liquid . The material was measured by DMA in shear mode at room temperature using a frequency sweep from 0.1 to approximately 30 Hz. The frequency dependence of the storage modulus, G’ gee prime, and loss modulus, G’’ gee double prime, are shown in red and blue, respectively. The storage modulus, G’ relates to the elastic component of the sample, whilst the loss modulus, G” corresponds to the viscous component of the sample. Note that, at about 8Hz, G’ and G’’ are equal. The plot shows that at frequencies above 8 Hz, the elastic behavior of the putty dominates its mechanical properties (G’ greater than G”). The putty behaves more and more elastically, however, with increasing frequency. Since bouncing and impact are associated with frequencies in the range of a hundred Hertz to kilohertz, the elastic behavior of the putty can be explained by the dominant G’ value at higher frequencies. On the other hand, where the applied frequency is lower than 8 Hz, G’’ is always larger than G’ and therefore, viscous flow dominates the mechanical properties of the putty at room temperature. The modulus of an amorphous material, at a certain temperature, depends on the frequency at which it is tested. In the schematic modulus curves of a polymer, depicted in this slide, a large change in modulus is observed in the glass transition region. The plot on the left hand side, shows the variation of modulus, measured as a function of the temperature, at a fixed frequency of 1 Hz. The plot on the right hand side, shows the variation of modulus, measured as a function of frequency, at a constant temperature of 25 °C. From this, it can be observed that the glass transition occurs at 25 °C when measured at 1 Hz. However, the temperature would be higher, if measured at, say, 0.1 Hz. In the logarithmic frequency presentation shown, the two curves appear as mirror images, where temperature is inversely proportional to frequency. This relationship between temperature and frequency can be used to obtain information about the modulus at frequencies that are experimentally inaccessible. Since low frequencies correspond to long times and vice versa, the temperature–frequency equivalence is referred to as time–temperature superposition, or the TTS principle. The TTS principle applies to amorphous, isotropic homo- and copolymers and fully compatible blends. In other words, the material must not crystallize or melt in the measured temperature range. Similarly, the time–temperature equivalence is only valid for a single relaxational process. Where a secondary, or beta relaxation, overlaps with the alpha or glass transition process, one of these effects must be modelled and subtracted in order to obtain meaningful information. In practice, materials are subjected to loads at many different frequencies. This slide shows theoretical curves for modulus—upper curves G' & G"— and compliance—lower curves jay prime J' & jay double prime J"—of an amorphous polymer in log-log presentation. Compliance is the reciprocal of the modulus, i.e. strain over stress, therefore, as the modulus decreases, the compliance increases. The DMA frequency measuring range is shown in yellow. With the use of TTS, a detailed understanding of the effect of frequency on mechanical properties can be obtained at frequencies well beyond those experimentally achievable. Mechanical behavior depends on molecular motion in the chains, chain segments and side-groups of a material. Different molecular mechanisms occur at different temperatures and frequencies. At very low frequencies, uncrosslinked polymers exhibit flow. In the ideal scenario, the slopes of the modulus in the log-log presentation are two for G’ and one for G’’. At the gel point, storage and loss curves intersect, i.e. G’ is equal to G”. In the flow region, G’ and G’’ increase with frequency and J’ and J’’ decrease. This is followed by a rubbery plateau in which G’ and J’ are almost constant. A large step in the storage modulus is characteristic for the main relaxation region or glass transition. In the transition region, the loss or viscous components exhibit a peak. At higher frequencies, below the glass transition temperature, further relaxations can occur. Here, the secondary relaxation or beta-relaxation is shown. These sub-Tg relaxations are characterized by relatively broad steps in G’ and J’ and broad peaks in G’’ and J’’. At frequencies below the beta-relaxation, the loss compliance will usually have a slope of -1/3. To obtain the frequency dependence of the modulus and compliance curves, a master curve must be generated. I will now explain how this is achieved. 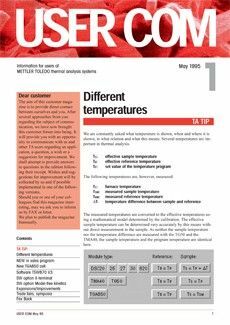 The next two slides demonstrate the construction of a master curve, covering an extended frequency range for a reference temperature, which should be close to, or above, the glass transition temperature. This requires frequency sweep experiments at different isothermal temperatures. As shown in the example on this slide, experiments in the frequency range of the DMA were carried out from -55 degrees Celsius to -35 degrees Celsius in incremental steps of 5 degrees Celsius. The sample temperature must be accurately measured, and the sample in thermal equilibrium, before starting measurements. This is a critical requirement for accurate master curve construction. 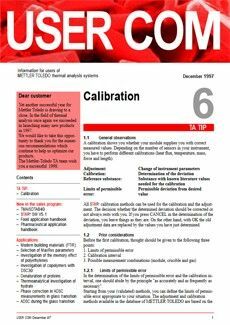 Care must be taken to ensure the sample does not change during the sequence of measurements, such as curing—in the case of a thermoset. 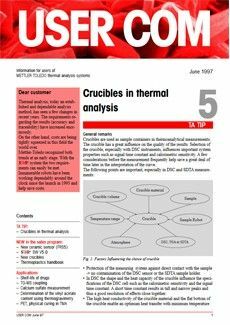 The evaluation is performed by mathematically, or graphically, shifting individual measurement curves, called TTS or isothermal segments, to create the master curve at the chosen reference temperature. Measurements taken at temperatures lower than the reference temperature are shifted to higher frequencies whilst measurements at temperatures above the reference temperature are shifted to lower frequencies. The reference temperature of the master curve corresponds to the sample temperature of the TTS segment that was not shifted. A master curve can, therefore, be created for any available temperature by selecting the segment that is not shifted. In this example, the master curve has a reference temperature of -45 degrees Celsius. Note that TTS shifts can be unreliable for reference temperatures below the glass transition temperature. This is due to the physical ageing that often occurs in materials, which can vary significantly depending on how the glass was formed, e.g. slow cooling or rapid quench. Each shifted TTS segment provides a shift factor. The shift factor obtained, log AT, can be graphically displayed in the shift diagram as shown in the insert plot on the right. The information obtained from such shift factors are discussed in the next slide. The shift diagram aT is used to obtain information on the type of relaxation. In the activation plot in the bottom left-hand corner of this slide, the log frequency is plotted against the reciprocal temperature, in Kelvin. The curves can be described using empirical equations. In the simplest scenario, a relaxation transition shows a linear relationship between the inverse temperature and the logarithmic frequency. This linear relationship is explained by the Arrhenius equation as shown in the upper right hand side of the slide. The Arrhenius equation describes an activated process, with a constant activation energy. This is usually observed for local processes, such as sub-Tg relaxations, otherwise known as secondary or beta-relaxations. Note that the Arrhenius activation energy can also be obtained from activation energy plots, made from multi-frequency thermal scans. This is much more straightforward than performing a series of step-isothermal measurements. If the transition in question is an alpha or glass transition relaxation, the activation plot does not yield a straight line. This behavior is explained by cooperative movement processes, as described by the Vogel-Fulcher equation or the equivalent WLF equation, named after Williams-Landel-Ferry, and is proof of a glass transition. This slide presents the master curve for the storage and loss shear modulus of an epoxy resin. The reference temperature is set at 120 degrees Celsius, and the sample was measured in the frequency range from 1 milliHertz to 1 kiloHertz under isothermal conditions. These measurements were performed every 5 degrees Celsius in a temperature range between 80 and 190 degrees Celsius. The master curve was constructed by the simultaneous shifting of both moduli curves along the frequency axis to achieve the best possible overlap. As a result of these shifting operations, master curves for both components of the complex modulus are obtained with a frequency range from 10-7 to 107 Hz. The shift factors of the isothermal frequency sweeps are shown in the upper-right diagram. At low frequencies between 10-7 and 10-4 Hz, the sample is in the rubbery plateau with a modulus value of about 2.5 MPa. The rubbery plateau value is determined by the degree of cross-linking. As the epoxy is cross-linked, it exhibits predominantly elastic behavior at low frequencies, i.e. the storage modulus is always greater than the loss modulus. An increase in frequency yields an increase in storage modulus by a factor of 300 (about 2.5 decades), associated with a peak in the loss modulus. This behavior reflects the glass transition of the cured epoxy. The lower right diagram shows the activation plot for the glass transition, where the characteristic frequency of related molecular rearrangements is correlated with the frequency at which the maximum loss factor is reached. In our example, this occurs at 20 Hz, at the reference temperature of 120 degrees Celsius. The nonlinear curve in the activation diagram indicates the temperature-dependence of the effective activation energy for cooperative rearrangements. The activation energy is given by the slope of log aT vs 1/T, for each temperature, where the x-axis is reciprocal Kelvin. At higher frequencies, the storage modulus is almost constant at about 1 GPa Giga Pascal and the loss modulus decreases almost linearly in the log-log presentation. This behavior is typical for a material in the glassy state. The shape of the master curve contains valuable information pertaining to the micro- and macrostructure of materials. In this slide, the influence of the molecular weight and the degree of cross-linking on the rubbery plateau, are shown. The plot on the left-hand side illustrates how low molecular weight materials begin to flow immediately after the glass transition, while those with higher molecular weights exhibit a plateau of stable behavior, prior to flow. Polymers have a characteristic modulus of about 1 MPa in the rubbery plateau. The plateau arises through the entanglement of macromolecules to form a physical network. The width of the plateau depends on molecular weight and polydispersity. The plot on the right shows how the degree of cross-linking influences the master curve. In cross-linked materials, the plateau modulus is proportional to the crosslinking density. If the density is known at this temperature—while assuming an ideal rubber network—an estimate of the molecular weight between crosslinks can be made. The master curves in this slide are the result of measurements taken from unvulcanized, and vulcanized SBR samples, at a reference temperature of -10 degrees Celsius. With decreasing frequency, each sample first shows a glass transition, followed by rubbery behavior. Here, the differences in vulcanization become apparent, in which the vulcanized sample develops a stable rubbery plateau across a wide frequency range, unlike the unvulcanized sample where only a very short plateau is observed. At high frequencies in the glassy state, storage moduli, gee prime, are almost constant at about 700 MPa. At these frequencies, the loss modulus—gee double prime—is significantly lower than the storage modulus. The region in which the storage modulus changes by several orders of magnitude from about 700 MPa to 1 MPa is the glass transition. 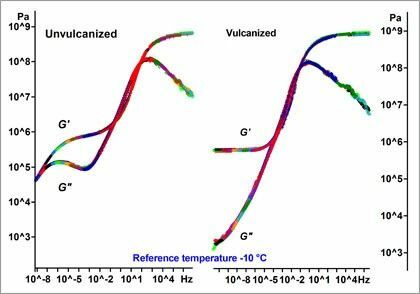 The cross-linking differences between the two samples have a marked effect on the frequency of the observed relaxation, from about 300 Hz in the unvulcanized sample to around 1 Hz for the vulcanized rubber. The rubbery plateau begins as the frequency is decreased after the glass transition. The unvulcanized material shows a storage modulus with only a relatively short plateau between 10-4 and 10-2 Hz. The position and width of this plateau is determined by the molecular weight and its distribution, or polydispersity. At very low frequencies, the storage modulus decreases and the material exhibits viscous flow. The point of intersection of the storage and loss modulus characterizes the reptation time. This is the time after which the dynamic mechanical behavior is dominated by viscous or liquid-like flow. Below this frequency, the storage & loss moduli vary with a slope of two and one, respectively, as previously shown in slide 5. In contrast, the vulcanized rubber sample only exhibits elastic behavior, as reflected in the low gee double prime value and the plateau modulus, which is proportional to the cross-linking density. It should be elastic between 1 and 100 Hz, corresponding to typical walking frequencies. Put differently, G’ should be high and G’’ low. Fluctuations in temperature and humidity occurring throughout the day incur inevitable stresses to the adhesive. The adhesive counteracts such stresses by exhibiting viscous behavior in the frequency range of 10-5 Hz to 10-4 Hz. This frequency range reflects relatively slow changes i.e. those occurring during day and night cycles. Additionally, the long term behavior should remain stable for several years. In other words G’ should be higher than G’’ to prevent flow. From this, one can compare how the materials behave in each region of interest. For example, PUR and PVAC adhesives fulfill the requirements for both walking and step frequency, but PUR is not resistant to day & night temperature/humidity cycles. This can be explained by the decrease in storage modulus being too small at Tg—its three dimensional network causes the material to be too stiff, and hence, unable to cope with temperature and humidity changes in day-night cycles. The PVAC based adhesives, with less cross-linking, are the better choice in this example, as they fulfill all requirements in the lifetime map—detailing the required responses in different frequency and time ranges. This slide details the DMA temperature-dependent measurement of an unknown elastomer at 1 Hz and 100 Hz in shear mode. The storage and loss modulus curves are shown in the upper plot and the tan delta curves in the lower plot. The frequency dependent step change in the storage moduli, with corresponding peaks in the loss modulus curves at around -60 degrees Celsius, are typical for a relaxation process. However, some additional information can be seen in the tan delta curve at 1 Hz, where a small shoulder is indicated by an arrow. This weak effect is no longer seen at 100 Hz, due to a broadening of the relaxational peak, which will be explained later on. The master curve shown in the next slide was constructed in order to determine the origin of this small effect. In this example, the time-temperature-superposition principle does not hold, as it is not possible to construct an optimum master curve over the entire frequency range. Polymers which are formed by two or more incompatible components (e.g. block-copolymers and blends). In this particular case, the experimental conditions were thoroughly checked and the sample was found to be quite stable. Therefore, the deviation observed from the superposition principle is due to an overlap of relaxation processes. The reason for the shoulder being missing from the 100 Hz peak is as follows: Sub-Tg relaxations will always have a lower activation energy than the main glass transition process. Since the temperature shift with frequency is inversely proportional to the activation energy for sub-Tg relaxations, they shift to ever higher temperatures with increasing frequency. Therefore, all relaxation peaks tend to merge together at higher frequencies. Consequently, testing at low frequencies is a good method to identify relaxational processes that could interfere with a TTS analysis of the main glass transition process. Ethylene vinyl acetate, or EVA for short, is used, among other things, as an impact modifier and plasticizer for PVC. For this purpose, an EVA with lower viscosity was developed to aid processability. Normal EVA can be stored as granulate, at 5 degrees Celsius, for up to 6 months with no significant agglomeration or adhesion observed. However, in modified EVA, with lower viscosity, granulate adhesion occurred after just a few weeks, due to lowered viscosity. To achieve similar storage times, as for standard EVA, one approach is to lower the storage temperature to increase the viscosity. At which temperature should the modified material be stored to achieve this? To answer this question, the viscosity master curves and log At shift plots for normal and modified EVA were determined at a reference temperature of 5 degrees Celsius, as shown in the diagram. The viscosity master curve for the modified material was then shifted to coincide with the unmodified EVA, resulting in a shift factor of log At equal to minus 1.6. The log At plot shows that this corresponds to a storage temperature of -5 degrees Celsius for the low molecular weight EVA. Thus a TTS master curve has enabled the determination of a storage temperature which will prevent agglomeration in the the modified EVA granulate. This slide describes the analysis of a very low molecular weight polyisobutylene sample. The left hand plot displays both components of the complex shear modulus, Gee prime and Gee double prime, plotted against frequency. The right-hand plot displays the magnitude of the complex shear viscosity vs frequency. The main structural parameter that influences the flow behavior, at temperatures above the glass transition, is the molecular weight. For low molecular weight polymers, which start to flow immediately after the glass transition, the chain entanglement is insignificant. Above a critical molecular weight, chains begin to entangle. The zero shear viscosity depends strongly on molecular weight and is proportional to it as shown by the equation in the diagram. Generally, the exponent “a” is equal to about 3.4. The factor k can be determined experimentally using the same polymers with different molecular weights. 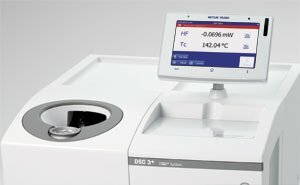 This slide gives an overview of the temperature ranges of the METTLER TOLEDO DSC, TGA, TMA, DMA and TOA instruments. TOA experiments can be carried out in a temperature range between minus sixty degrees and plus three hundred and seventy-five degrees Celsius. Several modes of operation are possible depending on the type of information required. Finally, I would like to draw your attention to our additional sources on time-temperature superposition, which you can download from the Internet. 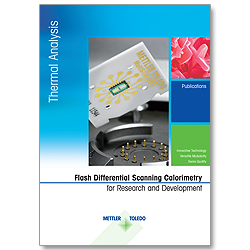 Our “Collected Applications” and “Thermal Analysis in Practice” handbooks contain many other examples, and are recommended for further reading. In addition, you can access webinars, application handbooks or information of a more general nature from the Internet addresses given on this slide, ensuring that you are always fully up-to-date in thermal analysis. This concludes my presentation on the time-temperature-superposition principle in thermal analysis. Thank you very much for your interest and attention.